We have added Mucho Vegas Casino to our list of top AU casinos, and it’s sure to bring you mucho real money wins. The casino was launched in 2016 and has since maintained a solid and trustworthy name in the online gambling. When you play at Mucho Vegas, the winning fiesta never stops. In fact, with the word mucho in the title you can expect your online gaming experience to be mucho fun! Check out our review below and all the reasons this is going to be your new favourite online gambling destination. It’s no secret that bonuses and promotions at online casinos far exceed those offered by their land-based counterparts. Given the highly competitive environment casinos needs to offer the best welcome package to hook players. So, how does Mucho Vegas fair in this category? Fantastically well! The casino offers a lucrative welcome package to all new gamblers. This includes a welcome bonus of up to AU$1500; plus 150 free spins. In addition, the casino runs regular promotions that help you boost your bankroll and make your online gaming experience better. These include an opportunity to win 100 free spins every Monday and a 100% reload bonus available every Wednesday. Furthermore, the casino rewards you with comp points known as ‘fiesta points’ every time you place a wager. For the high rollers, the casino runs an exclusive Jefe VIP programme. Here, you get access to personalised gambling services tailored made for high stakes bettors. Entry into the programme is easy, all you need to do is collect 50 000 fiesta points. Upon acceptance into the programme, you will receive a welcome bonus of AU$500 in credits. Mucho Vegas has mucho games from multiple software providers making the casino a multi-platform casino. The casino runs casino games from the biggest and best in the industry, including Microgaming, NetEnt, Betsoft, Quickspin, IGT and Pragmatic Play to name a few. However, Aussie gamblers will only be able to access games from Betsoft, Quickspin and IGT. Whatever your gambling fancy, you’re bound to find it in the games lobby. The casino boasts a fabulous combination of classic table games and exciting online pokies. Choose from roulette, blackjack, baccarat or speciality casino games. When it comes to online pokies for real money, your choices run into the hundreds, from classic pokies to 3D video slots to progressive jackpot pokies in an array of themes to suit Aussie gamblers. In addition, the casino offers top-notch live dealer games too! The casino’s main navigation includes a support page for all Mucho Vegas gamblers. The page includes an extensive frequently asked questions section; addressing all possible questions and concerns you may have. Should the task of reading not appeal to you, you can make use of the contact form available on the site. You can also make use of the Live ]Chat feature for instant responses. Customer support is available 24/7 from an Aussie friendly customer services team. Funding your real money casino account is simple, safe and secure thanks to an array of banking methods available. The casino offers popular banking methods that are easy to use; these include debit and credit cards, instant transfers and web wallets. The banking method you select will ultimately affect the length of time it takes to receive your payments. However, deposits are instant. When it comes to payout speed, the casino adheres to a 24-hour period. MuchoVegas.com is a leading online casino that provides tailored-made gambling experiences for Australian gamblers. 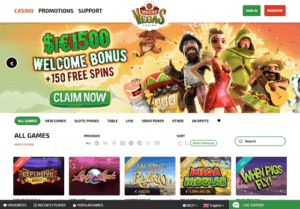 We believe this Mexican-themed gambling site is worth your real money wagers and rate it four out of five stars! 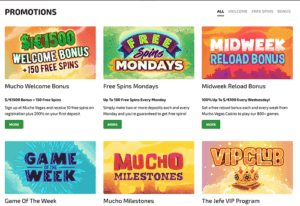 Sign up to Mucho Vegas and claim your welcome bonus worth AU$1500 plus 1500 free spins today!